Elections for Delhi Assembly have been announced. The fight to finish is gaining momentum and all stakeholders are in the ring to do their best. It is almost only 3 weeks to the day when the electorate would rise up to talk using their power to vote. What would be a better time to understand where the mainstream parties stand as they get into this election. Now one would tend to think this as a consolidation of opinion polls or exit surveys but this is not. It is an article by an MBA and hence as expected would deal with higher level analysis using the most common framework used to theoretically assess an entity – The SWOT Analysis. SWOT Analysis is basically a framework which asks to understand four basic parameters of an entity – Strengths, Weaknesses, Opportunities and Threats. While strengths and weaknesses are internal to the entity, the other two parameters are predominantly external. It is for the entity to use its strengths to leverage the opportunities while avoiding the threats to exploit the weaknesses. 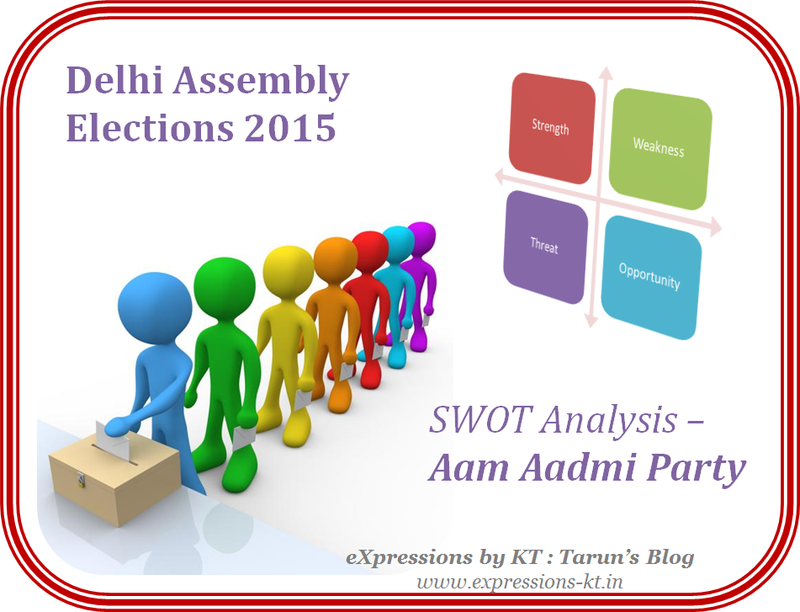 So in this election season of Delhi Assembly 2015, let us begin our SWOT Analysis with the party which is presenting a unique challenge to established political regimes in the state – Aam Aadmi Party or AAP. The main strength of AAP is its clean and brave image. Even those who do not agree with their stance would admit that Arvind Kejriwal has a very honest image among the masses. He would to some extent symbolize bravery because of the fact of taking onto the strongest of regime and the governments head-on. This is something which the voters have rarely seen in Indian politicians. Through the various exposes, and constant anti-corruption crusades, many believe AAP is notches above the existing political parties in terms of integrity, at least for now. Their emphasis on raising clean money and apparent accountability in declaring donations is something which strengthens their stand and brings in competitive advantage. These are definitely strengths that can be used to tap voters. Another key strength of the party is its loyal volunteer base. They have been able to include some very smart people at the top along with qualified volunteers who are spreading their word around. Most of the volunteers of the party you meet swear by their principles. Most of the candidates they have fielded until now have more or less a clean image and have been picked based on backgrounds of social service. In present context, the readiness and agility with which the party has shifted their agenda from sole anti-corruption crusade to an overall development of the state is worth admiring. While the party was formed on the issue of fighting corruption, politics is not a game of single issues. Until one can convince the masses that their aspirations from all perspectives would be dealt with, it is difficult to have their votes. While the party did get good support in their first attempt based on single issue but that was more of a momentum from the Anna Campaign which carried onto the elections. Today they are much stronger with a diverse set of agenda that the party is taking to the electorate. A lot of areas where AAP may need gradual improvements were documented when I did a series on political scenario after the General Elections in May 2014 (Read more here - In Hindsight - AAPka Bubble Bust ? Not yet but..). However if we look at high level there are two or three areas which are definitely proving to be a weakness off-late. First and foremost is the lack of a structured organization. Most of the posts which are dedicated payed jobs in other political parties are handled by volunteers. While it is good thing on one hand that people are ready to work for the party without money, a major issue with volunteer based work is that they cannot be held accountable for mistakes. There have been instances where AAP has bungled their messaging (including instances of showing Modi’s image on their website) which a professional agency would have definitely avoided. Though these have not done a major negative impact yet, but they do take the immediate focus from their main agenda when all of the top leaders have to come out and dis-own their party activities as mistakes of unsupervised volunteers. Another weakness that is coming to fore is the tendency of some of the leaders in AAP to “hit and run”. The party has been involved in way too many allegations which could not be taken to a logical end for lack of tangible evidence. While the leaders have come in front of cameras and pointed blames – personal and professional – at other parties along with claims of solid proofs, these proofs have not stood the required standards of probity. All in end that is left is an image in public that the party is simply interested in pointing fingers for political gains. Lack of resources is another area which is proving to be a limitation for them. While established parties have huge coffers to spend on their campaigns, AAP is solely dependent on much economical means for their advertisements. However this may not be a very big issue as until now, even mainstream parties have limited their campaigns to the media which is being used by AAP. However what is proving to be a major issue is their short track record which most people remember as a betrayal. Arvind may have had his reasons to not continue as the Chief Minister but that entire episode of 49 days has left some bitter memories for the people in Delhi and this would be a major weakness that the party would have to deal with in these elections. Arvind Kejriwal resigned in February 2014 but the assembly was not dissolved. Later after the General Elections in first quarter of the year, AAP had lost heavily in the battle where they fought on over 400 seats. It was the right time when the elections for state should have been announced as AAP was still reeling from the loss. However NDA government at the center chose otherwise reasons for which are beyond the coherence of a mere mortal like me (Read more at Delhi Assembly - Did BJP Err in Judgement?). Delay in elections have given AAP a lot of time to recover and prepare. The delay is definitely an opportunity which AAP should be able to leverage to its benefit. Compared to the last elections, Congress has further been dismantled across India with them losing most of the state elections after the debacle in national elections. The party does not seem to have recovered from that shock and does not even seem to be on a course correction path. Most of the cadre seems to have lost morale while leaders are shying away from taking to the elections. This would surely be a recipe for the party which has ruled the state for 15 straight years until last year, to perform worse that what they had done in 2013 Assembly Elections. Electorate understands well that voting for the party as of now is definitely not worth their effort. Thus there is an undecided voter base which is moving away from Congress and is ready to be tapped. If AAP can still make them keep their anti-BJP stance, that voter base could come in their lap. BJP has still not been able to name their CM candidate. There may not be a lack of leadership in the party but probably problem of many. An entire batch of leaders exist who at some level or the other would claim their stack to the chair. This is surely going to lead to some infighting which would harm the party. Delays in announcing candidates for the elections simply give credibility to these rumors. Furthermore, though 7 months could have been a limited time to change things on ground, people did have a lot of expectations and are feeling disgruntled to some extent. This could lead to some anti-incumbency which could be an opportunity to be leveraged. First and foremost threat comes from the chief strategist of BJP – the Chanakya himself – Amit Shah. He has a reputation of steering clear of foreground while pulling a base from below his opposition. His performance in UP where he swept away all local strongholds without them realizing what stuck is indisputable (Read more at Case Study on Team Building - BJP's UP Performance). He is sure to have plans on how to fight the irritants in local elections. He just played a masterstroke by bringing in Kiran Bedi into BJP’s fold. It is only to be seen if he declares her as the CM candidate and the fight would become really hard for anyone to sustain (Kiran Bedi - Amit Shah's Trump Card for Delhi ?). Other threat comes from its own leaders who once swear allegiance to AAP moving to other parties. Shazia Ilmi and Binni are just case in point. These leaders leaving the party leave an impression of it being a sinking ship which to a large extent is superficial. Now it is good thing for party to realize who its true friends are but politically they do prove to be a threat. While the party is pretty strong in some aspects primary because of the novel aesthetics associated with it, there definitely are some serious weaknesses which the party needs to realize and work upon. Though the present political scene presents a set of opportunities, but the time is running out soon. Other parties are moving fast and gradually strengthening their level of threat posed at AAP and are ready to exploit all their weaknesses to claim the win in these elections. all the online people; they will get advantage from it I am sure.